“Star Wars: The Last Jedi” opened this weekend in theatres around the country. 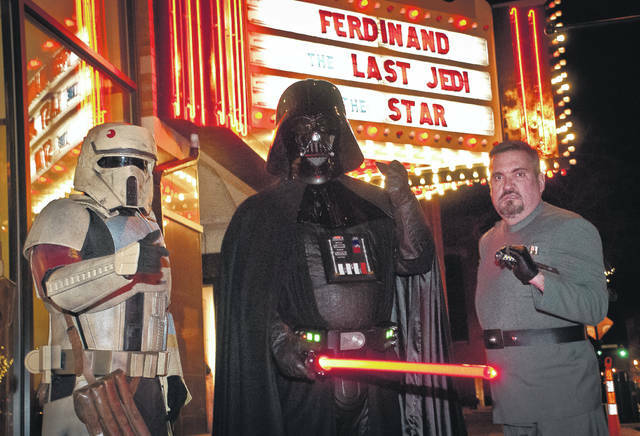 In Delaware, at 100-year-old Strand Theatre on Thursday night, members of the 501st Legion, an international “Star Wars” costuming organization, appeared in full gear, giving fans the chance to have photos taken with the characters. The 501st was founded to provide a collective identity for costuming fans and to put the club’s resources to good use through fundraising, charity work, and volunteering. Appearing in costume as a Shore Trooper is Nathan Hunt, left, from Delaware. Doug Frazier from Columbus, center, appeared as Darth Vader. John Mosser, right, of Ashland is dressed as an Imperial Officer. “We do it for fun and we do it to enhance the awareness of ‘Star Wars,’” said Frazier. Frazier said he made his first Vader costume out of paper mache. He said to be accepted into the club the costumes have to be accurate in detail and made of much more durable materials than paper mache. To see showtimes for “Star Wars: The Last Jedi” at The Strand Theatre, go to thestrandtheatre.net.